Providing you the best range of temperature and humidity monitoring sensor, online temperature monitoring system software for server room, server room temperature and humidity monitoring system, server room temperature monitoring system, smoke detector system for server room and temperature alert system(virat-886) with effective & timely delivery. Temperature and Humidity Monitoring Sensor manufactured by Jyoti Telecom is unique concept to keep watch on Temperature and Humidity. It gives alerts to people if the set temperature or humidity is increased beyond the limit. One can monitor /check temperature or humidity from any part of the country by using Cloud base software. System will send alert via SMS to users mobile at the same time it will do call alert also. Your data can be monitor, whether it is at home, at the office, or anywhere in the globe. You can export data in excel format. In this software you can add multiple devices location wise and monitor Temperature and Humidity. Inbuilt Temperature & Humidity Sensor. On Request Current Temperature & Humidity. Alert Type- SMS, Call alert with Voice, Email and Hooter Alert. · Server Room, UPS Room, Cold Storages. The Remote Temperature Monitoring System manufactured by Jyoti Telecom, is unique concept to keep watch on Temperature. It gives alerts to people if the set temperature is increased beyond the limit. One can monitor /check temperature from any part of the country by using Cloud base software. System will send alert via SMS to users mobile at the same time it will do call alert also. Your data can be monitor, whether it is at home, at the office, or anywhere in the globe one can access data 24/7.This is software which gives you data report of Temperature periodically in 24X7. Also you can export data in excel format. In this software you can add multiple devices location wise and monitor Temperature. SMS Programming and 5 Telephone nos.Auto Dialer. On Request Status of Current Temperature. Alert Type-SMS, Call Alert with Voice, Email and Hooter Alert. · Server Room, UPS Room, Cold Storages, Temperature Control applications. 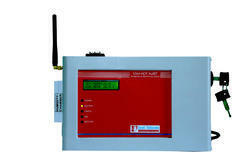 Temperature and Humidity Monitoring System manufactured by Jyoti Telecom. System gives alerts to user mobile no.if the Set Temperature or Humidity Increased beyond the set limit.GSM network used to send SMS,Call and Email Alert.Because of GSM technology used in system,user can remotely check Temperature and Humidity of server room. You can check status of the systems just by giving a missed call. The Remote Temperature Monitoring System contains GSM module and Micro Controller. The mobile number of the person can also be registered remotely by SMS programming. User Friendly & Easy To Install. 5 Mobile nos. Auto Dialer. · Cloud Base software to monitor Temperature & Humidity 24x7. 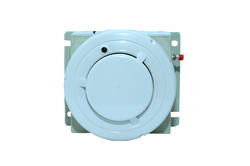 · Smoke and Water Detector. · Ideal Power Consumption is 30 mA. · Max Operating current is 1 Amp. Applications: Server Room, Battery/Invertor rooms, Cold Storages. Standalone Ready to use System. Max 5 mobile nos. storing capacity. The Remote Temperature Monitoring System manufactured by us is very unique concept to keep watch on temperature. It gives alerts to users if the set temperature is increased beyond the limit. The Remote Temperature Monitoring by using the GSM network. So no distance limit. One can monitor /check temperature from any part of the country by using cell phone. System will give Temperature alert SMS to users mobile at the same time it will do call alert also. You can check the Temperature / status of the systems just by giving a miss call or by sending SMS. The Remote Temperature Monitoring System contains one active SIM card, GSM module and micro controller. The mobile number of the person can also be registered remotely by SMS programming. Ideal Power Consumption is 30 mA. Max Operating current is 1 Amp. Smoke Detection is also an essential part of your Server Room Monitoring System.It is wireless sensor so no need to do wiring.This sesnor is configured with wireless GSM control Panel.You can install this sensor on sealing wherever required in the server room.If smoke is detect it will send signal to main GSM control panel and so user will get early warning of smoke in the server room by Hooter,SMS,Call and Email alert. With this System you can also Remotely Monitor Temperatuer and Humidity of Server Room.Temperature & Humidity Monitoring System is very unique concept to keep watch on Temperature & Humidity in server room. It gives alerts if the set temperature & humidity increased beyond the set limit. The Remote Temperature & Humidity Monitoring by using the GSM network. So no distance limit. · Wireless Technique,no wiring is required. · Wireless range 100 meter Max. · Operates on 9V.DC dry battery. · Battery backup up to 1 year. Indications- Safe zone: - Green LED periodically blinking. Fire detection: - Red LED if fire detect. 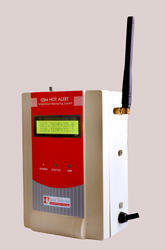 The Remote Temperature Monitoring System manufactured by Jyoti Telecom. This is compact and small unit based on GSM technology it gives alerts if the set temperature is increased beyond the set limit. 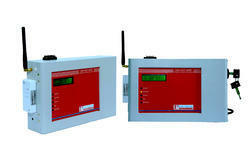 The Remote Temperature Monitoring by using the GSM network, so no distance limit. One can monitor /check temperature from any part of the country. By using cell phone. So this is very compact system you can mount anywhere in your server room. Three Phase Detector System manufactured by Jyoti Telecom is unique concept to monitor Three Phase Power failure. System gives alert if any individual phase fail or if all three phase (RYB) are fails. System will gives Phase fail alert SMS to users mobile at the same time it will do call alert also. With this system you can also remotely monitor Temperature and Humidity of Server Room. It gives alerts to people if the set temperature is increased beyond the limit. The Remote Temperature and Humidity Monitoring by using the GSM network. So no distance limit. One can monitor /check Temperature and Humidity from any part of the country. You can check the Temperature, Humidity and Phase status of the systems just by giving a miss call. The System contains one active SIM card, GSM module and micro controller. The mobile number of the person can also be registered remotely by SMS programming. Alert Type-SMS,Call alert with Voice, Email and Hooter Alert. UPS Power Fail Alert System manufactured by Jyoti Telecom is unique concept to monitor UPS Input Power failure. System gives alert if UPS input power is fail. System will give Phase fail alert SMS to users mobile at the same time it will do call alert also. With this system you can also remotely monitor Temperature and Humidity of Server Room. It gives alerts to people if the set temperature is increased beyond the set limit. The Remote Temperature and Humidity Monitoring by using the GSM network. So no distance limit. One can monitor /check Temperature and Humidity from any part of the country. You can check the Temperature, Humidity and Phase status of the systems just by giving a missed call. The System contains one active SIM card holder, GSM module and micro controller. The mobile number of the person can also be registered remotely by SMS programming. Water Detection is an essential part of your Server Room Monitoring System.Water can do considerable irreparable damage to IT rooms so it is vital you have the correct procedures in place.Each Server room water sensor is activated when liquid makes contact with the Water Detection Sensor.It detect water drop,and then triggers an alarm sending out alerts or taking automatic corrective action.This sesnrr is wireless and configured with wireless GSM control Panel.You can put this small size water sensor wherever required in the server room.If water is sense by it,it will send signal to main GSM control panel and so user will get early warning of water in the server room by Hooter,SMS,Call and Email alert. With this System you can also Remotely Monitor Temperatuer and Humidity of Server Room. · Wireless range abount 100 meters. · 12V Long battery life. · Gold Pin Sensor contacts,hence long life detection. · User friendly and easy to install. System status check by Mobile App. Temperature & Humidity Limit settable. The Remote Temperature & Humidity Monitoring System manufactured by us is very unique concept to keep watch on Temperature & Humidity in server room. It gives alerts if the Temperature or Humidity is increased beyond the set limit. The Remote Temperature & Humidity Monitoring by using the GSM network. So no distance limit. One can monitor /check Temperature and Humidity from any part of the country by using cell phone. A wireless Smoke Detector & Water Detector sensor can be configured with this system. You can check status of the systems just by giving a missed call or by sending SMS. 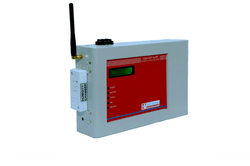 The Remote Temperature Monitoring System contains GSM module and Micro Controller. The mobile number of the person can also be registered remotely by SMS programming. Applications:Server Room, Battery/Invertor rooms, Cold Storages.